At Ayers Basement Systems, our basement flooring options are all made specifically for concrete basement floors. When installed in your home, our flooring options will never rot, decay or support mold growth. All of our flooring products are designed to easily interlock for quick installation without grout or adhesives. The interlocking flooring is ideal for basements since the flooring can be picked up and reinstalled if water gets underneath. Combined with our other basement products and our basement waterproofing system, it's a great way to upgrade your home! If you're interested in upgrading your basement flooring, call us today at 1-844-262-2971 or click below to get started. We offer free estimates in Lansing, Grand Rapids, Kalamazoo and throughout the nearby areas in Michigan & Indiana. Remodeling your basement can be a great way to transform a dark, gloomy space into an area you might actually want to so spend some time in. However, if your basement isn’t a stranger to water, it’s necessary that the products you install on your walls and floors can hold up if they come in contact with water in the future. These wise homeowners chose to upgrade their wood paneling to ZenWall paneling, which have a thick, encapsulated fiberglass core and a vapor barrier ton the back side which stops water vapor from coming in through the walls. The floors were then covered with ThermalDry, the only inorganic subflooring in the wolrd. The tiles sit on pegs, so water won't get trapped in the flooring, and in the case that there is a leak, it’s easy to dry the water under the tile without removing all of the flooring. ZenWall panels coupled with Thermal Dry make this basement bright, clean and dry. Basement floors are often made up of wood sub-floors. The problem with wood is if something were to start leaking in your basement, you’re in big trouble. They are easily ruined by water and are the perfect surface for mold growth. We installed our ThermalDry flooring system, a system made with the only plastic, all inorganic subfloor in the world. It won’t be ruined by water, vapor can’t pass through, and mold won’t grow on it. There are a variety of finishes to choose from so you don’t have to compromise style for functionality. After the heat from a steam cleaner damaged the floors in this home, the homeowners were forced to replace them. They called Ayers to install ThermalDry tiles, which is the only and best option for inorganic, water resistant flooring. Also resistant to water vapor and mold, these tiles are raised slightly off the floor with small pegs, so water won’t get trapped in them. They come in a variety of finishes, including a Parquet wood look as shown in this home. If a new basement floor sounds like the right option for your home, call the local experts at Ayers Basement Systems today. We will help you evaluate your basement and choose the best flooring option for your needs. 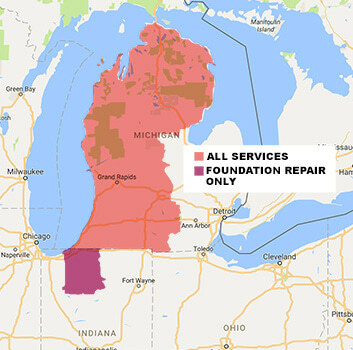 Contact us today to get started with a free estimate on all our basement waterproofing products in Kalamazoo, Lansing, Grand Rapids, Traverse City, Muskegon, Battle Creek, Mount Pleasant, Jackson, Niles, Alpena, Traverse City and throughout the surrounding areas.